This is the 3rd revision in the "Wizard Killer" series of builds based on the Martian II frame. The original Wizard Killer was my response to the successful Eachine Wizard RTF quad. The Mark III supersedes the more budget oriented Wizard Killer Mark II and is the most featured packed, simple to build and powerful of the three. The base weight with props is about 326g and fully loaded with a battery and Legend 3 it's nearly 600g. While the frame assembly is fairly straightforward there are a few tricks I've learned to make the process go smoother. Start with the bottom plate and loosely fit a single screw down through the small carbon plate and through the inner and outer screws of each arm. Loosely attach a nut to the bottom of each screw to keep the arms in place. You want a little wiggle room. The screw holes of the 4th arm may not line up quite right, so you may need to use a hex driver to screw through the carbon. It's a tight fit. Once all the arms have been fit into place send the same type of metal screw up through the middle holes and cap them with the included nylon standoffs. This process can be somewhat frustrating as there's virtually no tolerance between the arms. They fit together quite tight and sometimes the holes don't line up quite right. Fortunately this makes for a very solid build that's much less likely to break in a crash. Now you can slide the flight controller onto the standoffs and screw the motors onto the arms with blue Loctite. I like to rotate the flight controller to set the power tab off to the side rather than the back. This does require adjusting the yaw rotation in Betaflight later, but it makes for a much more tidy build and a more accessible USB port. I used Battle Cord to protect the wires, but this is entirely optional. I cut 7cm lengths of rope, removed the nylon strands and melted the ends to avoid fraying. You'll also need some shrink tubing to cover the ends. To solder the wires to the board it's a good idea to flux each tab first and add a ball of solder. To attach the motor wires it's easiest to start from the rightmost tab and work your way left. That way the previous wire won't get in the way of your tweezers. Of course if you're left handed you can start from the left. Cut each wire to size, one at a time, to ensure you don't cut any too short. To use 20mm standoffs you can use the linked TPU camera mounts, but if you've got a TPU-capable 3D printer you can print them yourself. The Thingiverse page is also linked below. First screw the TPU mounts onto the camera then bend them over the standoffs to situate the camera. The Caddx F1 comes with two wires. I chose to use the wire with the OSD connector to make camera adjustments an option later. I also sleeved the wires with more Battle Cord, but this is again entirely optional. Refer to the photos for wire placement. To wire the VTX it's a good idea to remove the 5v output and the second ground from the wire harness as we won't be using those. This VTX says it requires 7V, but it seems to work just fine running on 5V. There is always the potential for a brownout running at a lower input, so if you are concerned you can wire this directly to the rings around the main power leads. Now you'll want to add an XT60 to the power tab. The frame kit expects you to solder the XT60 directly to the tab, but it's much safer to add some 14AWG wire between the XT60 and the tab. This will better protect the tab from breakage and increase the height of the XT60 for shorter battery leads. To do this first solder about 1.5cm of wire to the XT60, add shrink tube and then solder the wires into the holes while the quad is upside down. 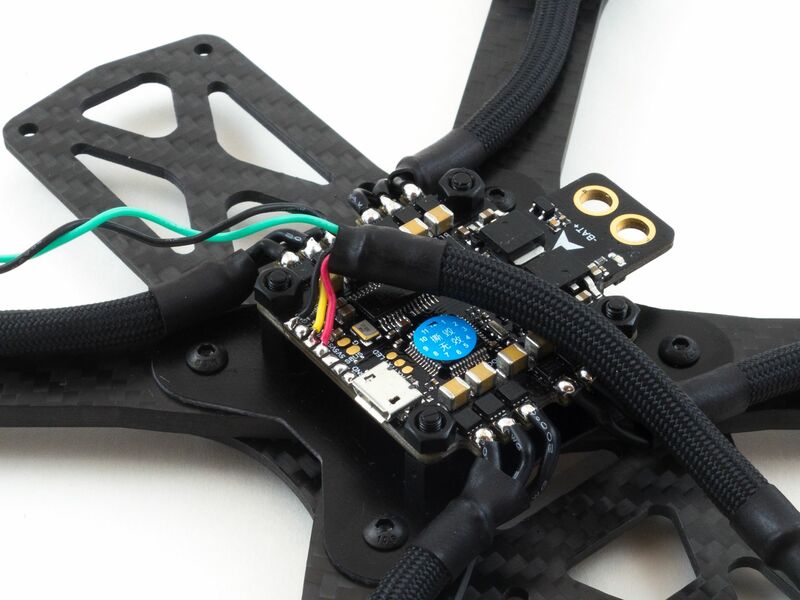 You can also add a capacitor as it greatly helps reduce noise to the gyro and creates a much cleaner electrical environment for all of the components. You can solder a pair of motor wire trimmings onto the capacitor and slide them under the flight controller from behind. Solder them directly under the main power tab. Be sure to match the polarity. If you're using the XM+ the RX is very straightforward to attach. You simply add wire between each of the Sbus, 5v and Gnd pads. If you're using an R-XSR or S.Port capable receiver and you want to use telemetry it is possible to use the LED pad as a 3rd UART for the VTX controls. It does require some CLI resource commands, so please search this RCGroups thread for further details. Considering this build does OSD I don't think a telemetry receiver is necessary. If you are using an IBUS or Spektrum receiver you can still use the Sbus pad and un-invert the signal via the CLI using the set sbus_inversion = off command. Please note that this board does not have a 3.3v regulator, so if you are a Spektrum user you will need something like this to power your receiver. At this point you'll need to apply power using a lipo battery to bind your receiver. It's always a good idea to test for continuity between each of your solders to ensure you didn't create any accidental bridges. Make sure you don't have any props on and apply power while holding the receiver bind button. Once you've successfully bound to your transmitter you can slide the receiver under the flight controller and add shrink tube to the receiver itself. To secure the antennas add zip-ties to the front arms pointed back toward the read motors. Add shrink tube to sling the antenna wires under the zip-ties to protect them from prop strikes. Now you can finish adding the standoffs and mount the VTX. Flip the VTX upside down and use some foam tape to attach it to the underside of the top plate in a way that the antenna can protrude through the circular hole in the back. Add a zip-tie to parallel the antenna and use some shrink tube to affix the antenna to the zip-tie to keep it rigid and protected. Attach the top plate and add a non-slip battery pad and your assembly is complete! Betaflight Configurator is now available as an executable here as well as the BLHeli Configurator. This is a change in light of a move away from Google Chrome extensions. Download both programs and plug your flight controller into your computer to begin. Go to the Firmware Flasher and choose "Omnibus" as well as the latest stable release of Betaflight. Set the UART1 Peripherals to "IRC Tramp". On UART3 click Serial RX for your receiver. Save and reconnect to Betaflight Configurator to test the motor directions. Uncheck all of the features you do not want and arrange your OSD as desired. This was, by far, the easiest build I've done. It requires a minimal amount of soldering and the short standoffs really give it a nice, low profile look. I love the way it turned out! This is a proven frame and should take some heavy hits. You don't need to use the countersunk washers, but I think they add a nice touch. These motors were just released so the durability has yet to be seen, but they've proven themselves in the power department. This build was courtesy of Banggood.com, and all the parts were selected by me. Hello Whiffles, great build! I found your instructions, pictures and buying links very useful. The drone is done and looks great. The only problem I am having is that it randomly jitters and shakes a little during hover. I tried replacing the propellers and playing around with gyro and D-filters but nothing helps. I am in airmode and have all sensors except gyro turned off. I have run out of ideas what the problem might be. Since you are way more experienced than me do you have any suggests on what I can try next to resolve? Thanks! Have you tried vibration dampening standoffs? Those usually do the trick. It's likely motor noise interfering with the gyro. How did you end up wiring the OSD control wires? I'm not sure which pads or if i need to do anything in BF to allow it to work. I dont know how to adjust camera settings with the micro eagle at all at this point. Thanks! You just need to feed the video from the camera to the flight controller and out to the VTX. The flight controller will add the OSD for you. This is not to adjust the camera settings though. You need to use the little control board included with the camera to do that. Ahh, i see that i was confused there, thank you! my micro eagle didn't come with a little remote, i guess it expects you to wire it to the FC and use the Camera_control resource. Does this build support RSSI? Mine only shows as 0%. Thank you again! It depends on your receiver. The XM+ has RSSI on channel 12 I believe. You can open the receiver tab in Betaflight to see. It'll be a channel that's constantly moving. You just need to assign it on the top right. Howdy! Thank you for the great write up, it went quite well for my first build. The only problem I am running into is that I cannot get any video from the VTX and unfortunately there is not a lot of manufacturer documentation for troubleshooting this part. The Panda VTX when powered up has a blinking red light and a solid blue light. When I try to go through any of the button sequences to change things, it does respond and the LEDs to change, but it seems like every time I change a setting, it reverts back to its original state. When looking in my goggles, there is one channel that has a pinkish hue to it for a second and then goes away. When I am pressing buttons on the VTX, the snow in my goggles is bright and intense, and then it goes back to an inactive background snow. So the VTX must be pushing out some sort of signal that is blasting the area with waves for a second. You mentioned in your article that there was potential for a brown out, could it be that and I need to solder directly to the main battery terminals? Or with the blinking red light, do I just have a bad board? So if you scan for the frequency with your headset you can't find it? I wouldn't bother with the button on the VTX itself and adjust everything via the OSD. I doubt it's a brown out issue as the 5v from the FC is ample. I haven't had any issues over several months of use. My only guess is you aren't on the correct frequency. Sorry for the late reply, got completely sucked up in the holidays. It turned out to goggle operator error on my part. I made the assumption that the VRX module frequency scan jumped to that frequency that was highest. It does not. I found the band and channel that the VTX was transmitting on and voila there it was. Then I was having problems getting OSD to show up on the video feed...turned out all that required was connecting the little caddix joystick to the green and black wires and changing it from PAL to NTSC and bam there was OSD. I'm finally all good to go...now if only it wasn't winter and pouring outside. Thanks again for such a great build, it made for a perfect first time. There you go! Yeah sometimes the scanners don't land on the exact frequency. Glad you're ready to go! Love this build and it has given me more confidence in selecting parts for my first quad! Thanks for that! I have made a Buildlog in which I have placed the list I have compiled. Could you give it a once over? Just had a look and gave some feedback on your Facebook post. hey brother. im new to this site and already i am intreaged about what you built here. Thank you buddy. my email address is famms00@aol.com if you would like to discuss anything at all. Is the Foxeer Arrow Micro compatible with the Racerstar StarF4S ? Do you think I will have enough space even with the 20mm standoffs? Is it worth to upgrade the transmitter to the Eachine TX5258 ? Or is the one you proposing good enough? Should I upgrade the drone antenna? Which ones do you recommend? Is there enough space to put anti vibration stand offs ? Sorry for all the questions thank you! You might have to have a look at my CL1 Build Guide as it does a lot of what you're asking here. I wouldn't say the TX5258 is an upgrade. It's a much older style VTX and much more bulky. There is enough space for anti-vibration standoffs on the CL1, but you'll need to move the arms under the bottom plate of the Martian II if you want to use 20mm standoffs. Thanks for the detailed write up! Would you say you still stand behind all of the parts on this list since you first made it or is there anything you recommend that may have come out since? Also anything else I should pick up while I'm at it that wasn't on the list? Thank again! I'm still flying this and it flies great. The main thing I'd upgrade is the camera. Maybe consider the Runcam Sparrow 2 as that's a great little cam. If you have the budget you can upgrade the motors, but these are suitable for a first build. I'd also suggest soft-mounting the flight controller with some anti-vibration standoffs. That'll slightly increase the height of the stack, so you may want to consider mounting the arms below the top plate. That's what I ended up doing. this was my first build i've done. it was sometime frustating but now its finished. But i have 2 problems now. when i turn on my quad the video-feed stops after a couple of time. The quad itselves is still reacting on controls, but video-signal is lost. Could it be a problem of heat? The other problem i have, how can i change raceband and mw? When i try yaw lef + pitch up i can change everything i want, but nothing remains after plugging the batterie off and on again. Set / Exit / Save - Exit / Save - Reboot it still stands on the same default raceband and 25 mw. How long are you running the VTX before it stops? These video transmitters aren't designed to stay running without airflow for a period of time. After a couple minutes they'll shut down due to the high temperature. They need to be in the air. Yes, as long as you've got a feed for the first minute or two on the bench then you're probably fine. Just go easy on your first couple packs to make sure it's flying properly. Hey Whiffles! Love your builds! I'm going to use this one as the framework to do my first build (really my second, but a lot has changed in 2 years). I'm wondering if you think the EMAX RS2205-S motors are compatible with this build? I was more interested in those over the DYS because they are always out of stock and QC issues. Also would this build benefit from a capacitor to the battery connection like in your CL1 build? Sorry if these are pretty noob questions. ~Edit: I'm wondering if upgrading to the F4S FC is ok (or worth it)? I know there's a difference with no built-in inversion with the F4S but I'm not sure if that affects this build. 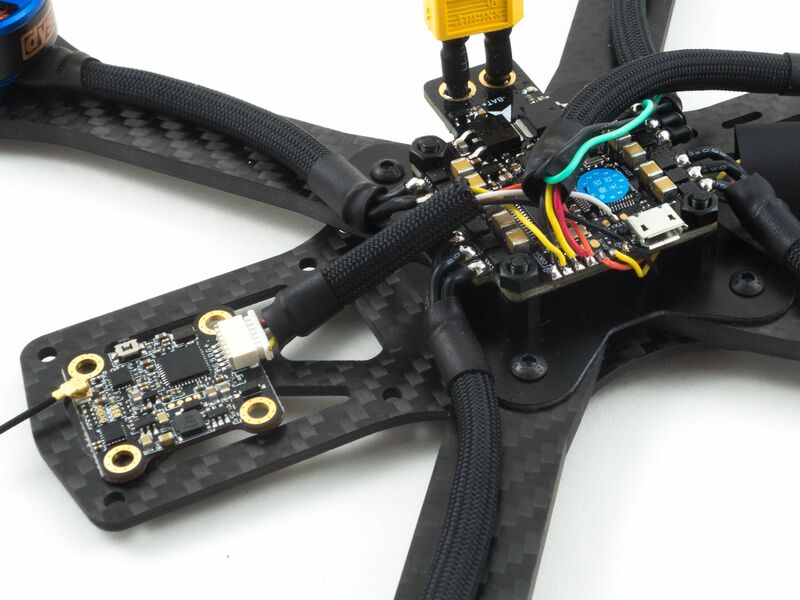 Also, any good replacement for the FPV TX which is OOS? Sure, those will work, but the motor wires are very short so you'll need to extend them. That's why I prefer DYS. They have longer wires. Maybe EMAX has changed over the past year though, so you may need to inquire further. Yes, definitely add a capacitor to the XT60. It's better to be closer to the source. No problem, I'm happy to help! I've tried the StarF4S variant and while it works well the power to the camera/VTX isn't as clean. You'll want to power your VTX from the main battery lead, so you need a VTX that can take more than 5v. Thanks for the reply! Definitely going to lengthen the wires. Alright so to simplify for myself I'm going to go with the StarF3S as per the build, and do a mini VTX03+Pigtail adapter with the Caddx SDR2. Sound alright? Sounds good, the SDR2 has a great image. Are you doing a U.fl to SMA and if so, what antenna? I have a pair of Fatshark Immersion RC spironet antennae lying around here with what appear to be some early Fatshark Predator goggles. I also have the DJI goggles Racing Edition with some of the DJI stock pagoda antennae. Not sure which would be better. I'd probably go with a more modern antenna. Those likely won't last very long after a few crashes. I've been flying the Strix Hoot lately and it's great and durable. I wouldn't put a pagoda on a quad unless it was well protected. Those are best used on a goggle. Looking forward to your future content! Hey Wiffles - Does the soldering orientation of the motor wires to the board matter, or is that all calibrated in Betaflight? I'll be watching a few Betaflight config videos today. I'm also in need of a new soldering iron. Any suggestions? Hey, so I'm trying to bind my Flysky i6 with the receiver. I Turn on the transmitter while pressing the bind key and it says RC Binding. Then I connect the battery to power the XM+ receiver while holding the small button. After that I Turn off both the receiver and the transmitter but for some reason they didnt bind. What am I doing wrong? Unfortunately the XM+ is only for FrSky radios. You'll need a FlySky compatible receiver. I'm sorry I didn't point this out. Look for an IBUS receiver on the part search here on RotorBuilds. https://banggood.app.link/71kzlJ2hHP. I also bought 2 antennas because I want to increase the range of the VTX and the receiver, but how do I replace them with the current antennas? I think that'll work, but you'll probably want to remove the plastic case and the pins so you can solder directly to the pads. You'll have to research which pads to solder to the flight controller. The VTX has a U.fl connector, so if you want to use an SMA antenna you need a U.fl to SMA pigtail. Then you can use any circular polarize SMA antenna you'd like. Okay so now I have the receiver bound to the transmitter, but I really can't find any clear pinouts on Google so I really dont have a clue which 3 pins I should use to connect to the flight controller. I tried connecting the iBUS SENS pins to the flight controller but when I tried out the throttle nothing happened. Do you have any suggestions? Thanks for your time! I get the message ''Unknown command, try 'help''' when I type sbus_inversion = off. You need to precede the command with set to indicate you're changing the value. Which version of Betaflight are you running? They removed this setting in the latest version and replaced it with serialrx_inverted which functions a little differently. Yea im using the last version, do I type "set serialrx_inverted = off" then? I believe that may be the default setting. You can check by typing "get serialrx". The latest version of BF is supposed to un-invert for you depending on what receiver you selected on the Configuration tab. Do you have the proper UART assigned to serial RX on the ports tab? And how about the Configuration tab? What did you select for the receiver type? I just checked a couple videos and it seems you need to use the iBus servos pins rather than the iBus sensor. See if that signal pin works instead. Thanks! Yes its working now, the only problem is that when I arm the drone, the motors start to spin. I did some research but I cant find how to solve it. Do you know what I should adjust so the motors dont spin as soon as I arm the drone? Great! Yes the motors should spin to let you know it's armed. That's normal. Thank you so much for your help! Its finally flying now, but I have a few questions. Im not really satisfied with how I mounted the antennas of the receiver(2black ones). Do you have a better option? Also, I want to learn to fly with goggles on but I dont have any experience with VR flying. How can I learn this the best way? Awesome! I like what you did with the blue and purple countersunk screws and washers. Try mounting the antennas like I did off the arms. You want them to be at a 90 degree angle and it's safer to mount them horizontally as they won't get crushed. Download a sim like Liftoff and practice acro for several hours before you try actual FPV. Make sure you've got a lot of open space before you try FPV for the first time. Thank you, I'm going to do that! Great build, love the idea paracord to protect the wires. I built the same quad myself and i am suffering with a problem. Every time i try to do a snap roll with it, it spins violently to the ground. Aside from flips it flies like perfect. I was just wondering if perhaps there was a way to resolve this. Did you add the capacitor? I wonder if it could be a problem with gyro noise. No, i did not add the capacitor. That could be it though. Would gyro noise effect any other aspects of the quad? Definitely add a cap and see if that does the trick. It could be the power spike that's affecting the gyro. Try holding the boot button on the FC as you plug the USB plug into your computer. Sometimes it won't go into DFU mode without the button, but it usually does. Where is the boot button on this FC? It seems this one doesn't have a boot button, but rather boot pads. Look for the word "boot" on the board and the two pads beside it need to be jumped with a screwdriver tip while plugging the board in. Just be very careful not to touch anything else and short out the board. Have you been able to connect to the board normally to get to the configuration? If not, maybe it's not a problem getting the board into DFU mode, but rather a driver issue with your computer. But before I do any of this, I still have no idea if something went wrong during the build. The outside looks correct, but I have been connecting and soldering for about a month. It's my first drone and I really want to succeed, however I just don't think it was built right. Do you have a multimeter? Just make sure to check the continuity between each of your joints. You don't want any of the solder of one touching the other. Also, what soldering iron are you using? Those joints look pretty jagged. You need a good iron that can maintain 450C. I'd apply some flux to those joints and clean them up with a hot tip. It looks like your iron isn't powerful enough and maybe your solder isn't the best quality. You may need to practice soldering and clean some of that up with solder wick. First off...thanks so much Whiffles for these great build instructions! Quick question...do you think the micro-eagle camera will fit into this frame with 20mm standoffs? I love the low height but I'm concerned the camera might not fit. Thanks! I think it might just fit, but your may have limited angle options. I don't have one to test, but it looks like the red cover may be slightly taller than the Caddx cover, so it'll rub against the top plate a little. Ok...thanks so much for the input! Where are all the tabs in the Betaflight configurator? It sounds like you might need to watch some video tutorials for configuring Betaflight. Watch at least 5 videos to familiarize yourself with the software. This is my first drone I'm building and my introduction to drones, some of the directions are a bit confusing and hard to follow for newcomers to the drone world. It would be great if you posted a video of you building it so everyone can see and follow your steps. Thank you for the drone parts and list, and have a good day! I might just do that in the future, thank you for the suggestion. Let me know what parts aren't clear and I'll help you out. The Camera, Video Transmitter, and VTX parts are unclear because there are so many wires bunched up and I cannot tell which wires go where. How do I remove 5V and second ground, do I just not use them? What nails do I use to put the XT60 in place? How do I add a capacitor? If I use an XT60, then I don’t follow the XM+ right? Thanks for all your help and I appreciate you taking the time to write all these instructions! My soldering is alo not good, does it matter if the soldering is linked together? You may want to watch some of the UAVFutures Build Videos on Youtube prior to building your first drone. It makes much more sense when you know what a part and wire do rather than blindly following a guide. I understand it's a lot of information and you're excited to fly but the knowledge of what goes where is very important. Even more important when you have poor soldering skills. You remove the wires by just prying the respective white tab on the connector which allows you to pull the wire out. I'm not sure what you mean by nails for the XT60? It's just soldered on. I think you might need to watch a few build videos to get a general idea of how these go together. 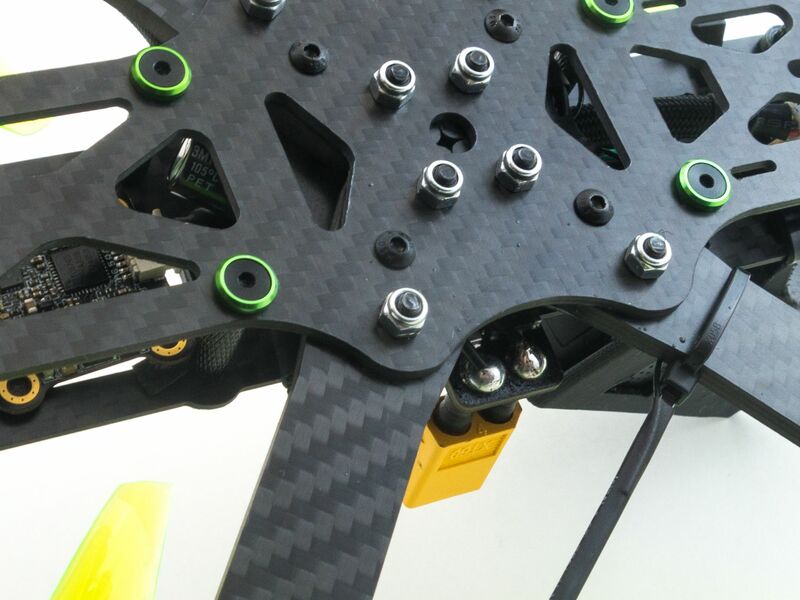 does the Panda RC (VTX) have to be dangling? And how do I plug the drone into my computer? It's a good idea to use some double sided tape to hold the VTX in place. You plug the flight controller in with a micro-USB cable. 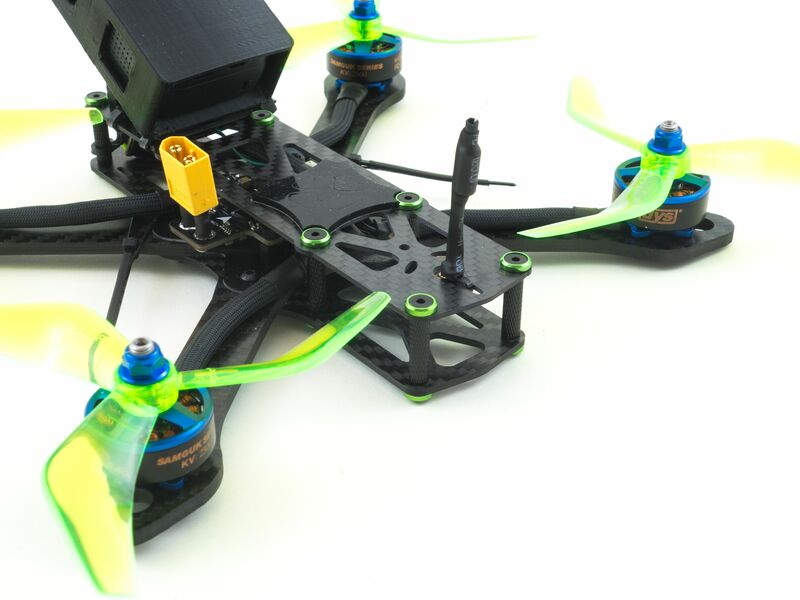 I was looking to buy ARTF quad, but your guide has just changed my mind to build my own! I am fan of 110, 150, 180mm's but this also is a monster. One quick question. I have my radiolink tx and rx. I think I can plug and play? The size of the quad really depends on how much space you have. 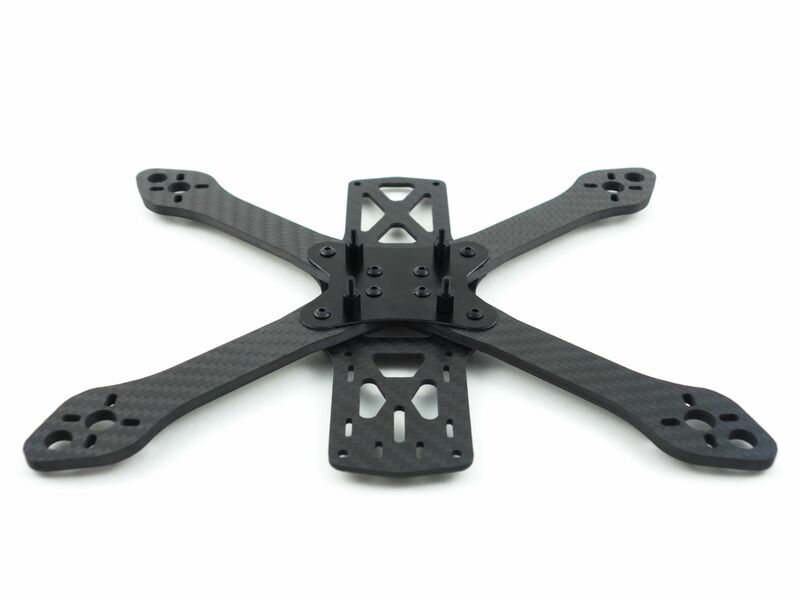 5" quads are the most common and you'll find the most support, but some people just don't have the space to fly them. I'm not very familiar with Radiolink, but you'll want an Sbus receiver. I'm not sure if Radiolink receivers use an inverted signal, so that's something to keep in mind. If you use an F3 flight controller like this then you can un-invert the Sbus pad via the CLI. If you use an F4 flight controller you cannot and you'll need to use a different UART. Not much in this hobby is plug and play though. You'll have to get really handy with a soldering iron. Thank you for the respond and the notice. I know that my RAdiolink AT9s and rx support SBUS. So that will not be a problem I guess. where do the green and black wires of the fpv camera go? Please, I have been racking my brain over this for days and I dont know where else to go. I've got this beauty assembled and rearin' to go but I'm having receiver/betaflight issues. My taranis X7 is bound to the receiver but none of my inputs are showing up in betaflight's receiver tab. It feels like I've looked everywhere for a solution and everyone who has exhibited a similar predicament has found a solution...not I. Only other thing I can think of is a DOA receiver. I am at a complete loss. I appreciate your time to no end. I had an issue like this. Mine was caused by using the newest version of Betaflight Configurator with an older version of the firmware on my flightcontroller. From my research doing so and saving settings can cause bugs which can only be fixed by flashing the firmware. For me, updating the betaflight version on my flight controller solved all my problems. Have you found a solution to yours by now? I'm very sorry I overlooked your comment. Were you able to solve this? No problem! I deduced the issue was gremlins..I replaced the rx and fc each with no success. Then somehow I fried the new fc on the bench so I figured I'd reinstall the old one because I thought "well what do I have to lose".....and now everything works great and I'm in the air! Sorry to hear about the dead FC, but at least you got it working! How does it fly? It flies great! Almost too great..to the point where Im thinking about possible upgrades here and there. I was thinking of either upgrading the vtx altogether or getting new antennas for my goggles (eachine ev800d). Any suggestions or sage advice? First off, this a great build and I really appreciate you taking the time to create this site and share such detailed information. Many of the builds on here assume a lot of prior knowledge, some are no more than a part listing and some pictures of the finished quad! One small thing not clear to me at first was the receiver placement though I figured it out by going through all the pictures in the album. So, if you're about to build or configure this, I suggest you also go to the CLI tab for the command line and type "diff" then save to file. Another thing to remember is to Save and Reboot or Save before moving onto the next settings tab. As far as I know, this a trustworthy tool from Impulse RC and is not installing anything bad, but you should do your own research. Finally, I had some issues getting BLHeli to connect. I think partly it does not like it if you still have the Betaflight Configurator open, even if you are disconnected. Here are my settings which are probably wrong, as this is my first quad build! However, it does fly! Great little recount of your experience! Just a couple tips. If you don't want videos to embed just add a label to the link [label](link). And for the diff add 3 ticks above and below the code to isolate it. I adjusted the yaw 270 degress as I figured I'd have to do that. There's only 2 Quad configs (Quad X and Quad X 1234) and both of them aren't correct. Either what betaflight thinks is 'front' is my side or similar. What should I do/troubleshoot from here? Did you try setting your yaw degrees to -90? That may be what you need. You'll also need to change the motor positions with a different set of resource commands. The resource commands in the guide assume the FC is in the same orientation I used. Check this guide to learn how to adjust the motor positions. I'm not very familiar with those motors, but they should work just fine. 2307 is a lot of motor, so just make sure you're comfortable flying with that amount of thrust. I'd start with something a little less powerful if this is your first build. Looking good! Be sure to post it to the site when it's complete. Absolutely! So glad I found this site, btw! I'm going with a red and black scheme.. Call it the Mark III Black Widow haha! Hi Whiffles, the indicated battery is out of stock, the same version but then 70c instead of 85c is available. Do you recommend to wait 2 weeks before it's back in stock or do you think it's fine to order the 70c version. (also 1500mAh, 4S model, 14.8v, XT60 support etc. Lots of batteries will work. Have a look at some of your local shops to see if they've got something good. The GNB, CNHL or Tattu brands are all good. Just look for something that's 1300 or 1500mah. The C-ratings are never real, but it's always good to buy the highest rated battery. should we be trying to stay within a certain weight? and what is the draw on these motors 23.4 amps or 36.2 ( just trying to wrap my head around this). This isn't a lightweight build. It's a pretty average weight. It really depends on the restrictions in your country. I know that Canada requires less than 250g, but you can fly larger quads in the USA. Generally 30A ESCs are more than enough for any motor. Hey - nice builds, love the way to discover & collect parts lists on this site! I've "mix&matched" a total starter build based off the 3 wizard killer builds you made, but using 4 separate ESCs since I expect to break a lot of stuff while getting started. Would love to get some input from you! I just added a little feedback. awesome build! i can't find the thingiverse link for the micro cam mounts anywhere here. i scrolled all the comments too- maybe I'm blind? Thanks! Thank you! Here's the link. dude you are lightning fast! Thanks! Your tutorial made me purchase almost the exact same parts and made me create an account here. For the motors being soldered to the flight controller, is there an order/specific way to solder them? They all look black/the same. Welcome to the site! Nope, the order doesn't matter. I just like to make sure they don't cross over each other. You'll want to change the motor direction in the BLHeli Configurator after you're done building. There's always a motor or two that spin the wrong direction. I'm not very familiar with Flysky, but just make sure your receiver supports ibus and not PPM. Be sure to note that you'll have to disable sbus inversion from the command line as mentioned in the build guide. Ive got all the parts in and have put everything together. Except i left off the camera and VTX for now because i dont have my googles yet. I wanted to do some flying by LOS but i plugged in my battery and flew off the ground just a little then landed. Now when i plug in the battery nothing happens. There are no lights on or anything. I didnt crash or hit anything. Any ideas why its not powering up? When i plug into my computer it will connect to betaflight. Please help!! Thanks! I would check your power lead. It sounds like power isn't getting to the board. Use a multimeter to make sure you've got continuity between the pad and the XT60 connector. It could be a dry solder joint or the wire may have disconnected. It really depends on your budget. I'd try to aim as close as possible to the Mark III if you can. Unfortunately you won't be able to pull off the 20mm standoffs with a 4-in-1 plus a flight controller, but you should be able to manage 25mm. Hi Wiffles. The flight controller you recommend is currently out of stock on Banggood. Are there any alternatives or should I wait for the restocking? Try the TattooF4S or the Lumenier Alpha AIO. Either one is a great board and offers more features than the StarF3S. I think it's well worth the extra $20. Great. Thanks for the quick reply. I'll look into them. It uses an F4 processor which allows for 8khz gyro and PID loop frequencies. It's also a bit better at noise reduction with the capacitors and it uses a switching regulator so it doesn't get hot like the StarF3S. Yes, it is a high price to pay for a single component, so you could consider a separate 4-in-1 and a separate flight controller. thanks a mill for this build plan! flys like a dream. my vendor upgraded me to RACERSTAR f4 when the spec'ed f3 was out of stock . Great to hear! Be sure to post it to the site so we can have a look at it. Oh, okay. Will do. Thanks for direction. The banggood link for the FC notes that the mounting holes are linked to positive power and that you need non conductive screws. Did you have to work around this in any way or is the included hardware for this frame good to go? I just used the included nylon standoffs, so no problem there. thanks a lot....nother noob question- wth is the little buttony thing included with the camera? When the camera is powered you can plug that into the little plug on the wire harness to change the camera settings. You can change the color, contrast, brightness, etc. 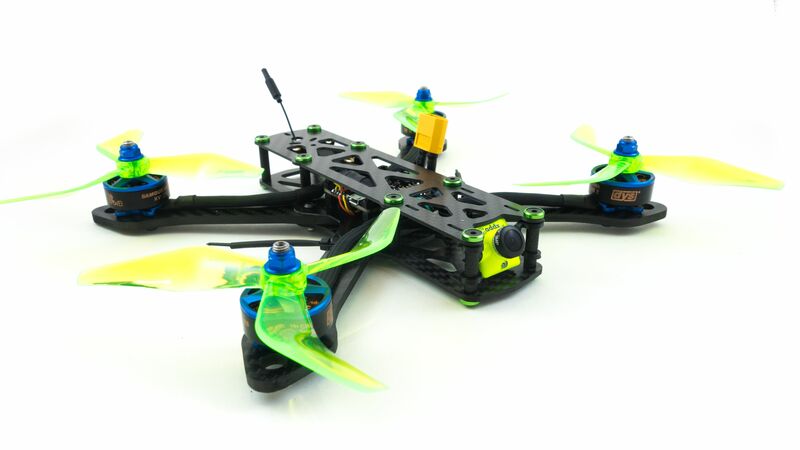 Im trying to build this quad but im not sure where and how to mount receiver and fpv transmitter. The receiver just needs some shrink tube so it can slide under the flight controller. It doesn't need anything to hold it in place once you've got the antennas in place on the zip ties. For the VTX I just used some double sided foam tape to stick it to the top plate. Be sure to use the flat side without any components. Thank you very much :) Its almost done. Just about to start on the build yey! Whiffles do you know of any 3D printed antenna mounts that i can buy or download the files off www.thingiverse.com for the martian 2 frame. I want to use the TBS unify U.fl pigtail SMA i have seen a few but they all seem to be made for the original standoffs not the 20mml standoffs or do you know of any other way to mount a SMA antenna. Again thanks doing such a neat build guide and answering my previous questions. You can just use a 50mm U.Fl to SMA adapter and send it through the circular hole toward the back of the top plate. That's what I did to upgrade the antenna. HEY! i am building my first drone and am thinking about using your build. i just wanted to ask how these motors have held up? I saw some reviews saying they werent very durable. i was thinking about using Racerstar 2205 2300 kv motors. Do you think there would be any problem with that? THANKS! They hold up just fine. The bearings might get worn out pretty quick, but I wouldn't say the Racerstar motors are much better quality. The Samguks have a lot more power for the price. https://www.banggood.com/Racerstar-StarF4S-30A-Blheli_S-Dshot-4-in-1-ESC-AIO-F4-OSD-Flight-Controller-w-BEC-Current-Sensor-p-1165076.html?rmmds=detail-left-hotproducts__2&cur_warehouse=CN ? It's just a few dollars more. I am beginner, currently training with hubsan 107p. Will it be good for the first FPV quad? Do you recommend the 3s battery for begginers? Or is there an option to reduce motor power? Thank you. That'll work and with F4 you'll be able to run 8k/8k on your gyro and PID loop. That should help with the new stage2 filter. But if you haven't flown an FPV rig you might want to start smaller. Maybe something like the Babyhawk-R to get comfortable with the controls. You could also try learning on a sim. I'd start with 4S because eventually your 3S packs will just collect dust. The F3S FC listed in this build has been out stock for awhile, is there going to be any differences in configuration by going with the F4 FC listed by Mario? It looks like it's in stock now. Thanks for this nice information, i am rather new into this and want to buy all the items described above. The only info that is missing is what controller (to one you keep in your hands) to use. Can you maybe give some info on a good controller you recomment for beginners? There are a number of transmitters available. I think the go-to is the FrSky Taranis QX7, but I've been flying the Jumper T8SG Plus. Have a look at my review on the Guides & Reviews page. 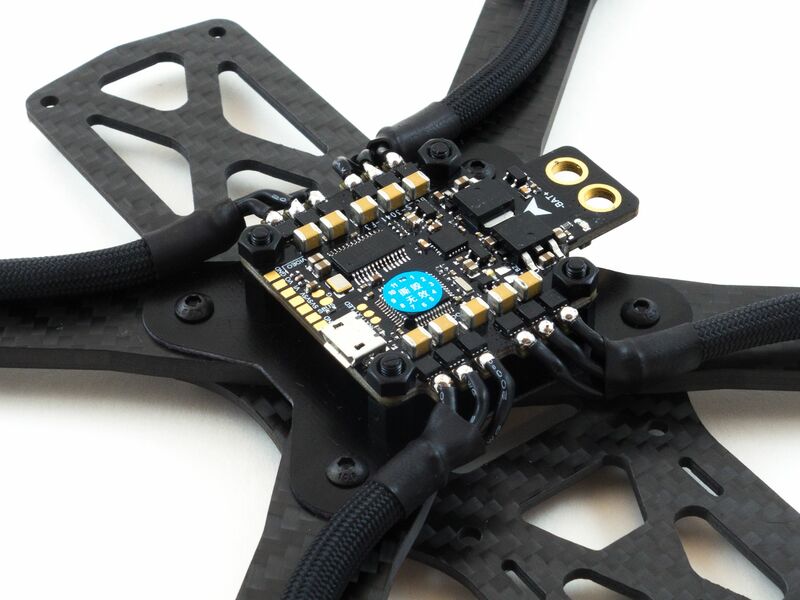 Another consideration is the upcoming Frsky X-Lite which will be out in a couple weeks. Thx for the quick reply, i think this is in combination with a goggle right? What is the best alternative with an on screen controller. In my country it is officially not allowed to fly with goggles. I will also check your review. 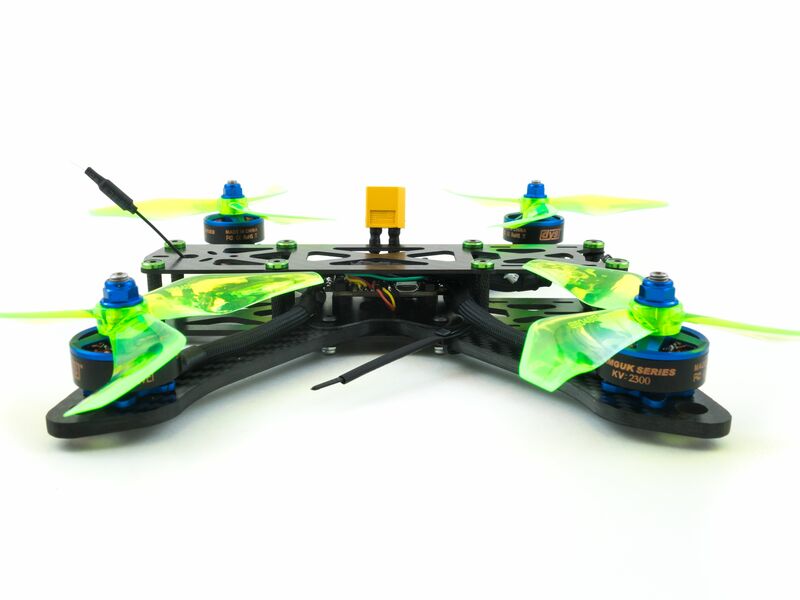 Yes, this is an FPV quadcopter, so you need goggles to fly it. Are there any videos of this thing flying? How would this compare to the RTF Emax Hawk5? I don't have any noteworthy flights recorded on this, but it does fly really well. I'm not very familiar with the Hawk5, but from what I've heard it's a great RTF quad. It really comes down to your budget and willingness to build. This will perform nearly as well, but it does require assembly. Did you use the 2300kv or 2600kv motors? I used the 2300kv motors on this one. Just finished this as my first build, it looks and flies great! Super glad I follow your build. Thanks for the amazing guide and answering all my questions! Awesome, looks great! Be sure to post it to the site. Very nice build and write-up! I'm looking to get back into 5 inch and this one feels safe. :-D Everthing looks like the old 250 style with a new spin. I do have one question that I can't find the answer to. What is the width of the arms? Thinking about using individual esc's if the overhang is minimal. Thanks! They're about 16mm wide, but why use arm ESCs? It's much cleaner and easier to use a 4-in-1 or even a 5-in-1. ESCs have come a long way and very rarely fail due to over-amperage. Hi Whiffles i am doing this as my first bulid i have orderd all the parts so i am just waitning for them all to be delivered! the only thing i have ordedrd diffrerently was the camera i got the Caddx Turbo micro SDR1 do i just wire it up the same? cannot wait to get started. I will upload some pictures when it is done and will probably be back to ask questions when i get stuck lol. great great bulid and write up by the way. Great choice with the SDR1. Yes, it wires the same way. I hope the build goes smoothly! how durable is this build? I orderd the same camera fc and motors. How do they hold up in bigger crashes? I don't think you need to worry about the durability of the camera or FC, but the motors are another story. I have heard the bearings can start to go bad after 100-200 packs, but I haven't run them enough to experience this myself. For the price though these motors can't be beat. Yes I heard the same. Just to be safe I ordered 5 of them and some fushi abec 7 bearings. Got a friend who got 2 of those bords and both of them blow up after couple of flights. How many packs have you flown with this build? Did the esc survive? I have the 5040 kingkong props hope the escs/motors will last long. Wow, you mean the StarF3S? How did it blow up? I've flown only about 10-15 packs on this, but the board hasn't been a concern or issue at all. Also, would the board still be able to support the xt60 if it wasn't turned 90 degrees? The wires under there go to the capacitor and yes you can still get an XT60 no matter the orientation. You'll just need longer wires. I don't recommend this though because your USB port will be inaccessible. Any reason you want to orient it that way? It has an OSD and a current sensor, so you just watch the values in your goggles. I generally watch the mah used and once it reaches 800-900mah on a 1300mah battery it's time to land. Where are the boot pads or button? You don't need a boot button to put it into DFU mode. You can just use the Firmware flasher which will put it into DFU for you. If you use taller standoffs you can double sticky tape the included camera bracket to the baseplate, but the 3D printed mounts are ideal and allow for a much lower profile rig. I like the Hakko 888D, but the TS100 is a good little portable iron. For Spektrum I think you want the serial diversity receiver. Great thanks, another question (sorry noob here) to sav money can i buy just the standoffs and use the bolts from the martian kit instead of the separate ones. Those are purely aesthetic, so you can use the included screws. As for a gool soldering iron: i use a copy of a hakko, 939d. Heats up fast, cheap, nice quality, free shipping on ebay. And the copy fits the real Hakko tips so you can buy replacements. Whats the difference between base and total? The base price excludes all of the arbitrary parts like the misc parts, HD camera, props and receiver. Base is what you would buy if it were a BNF rig. what is a good cheap charger? Any of the iSDT models are good. I use the cheapest one and it works just fine for my purposes. 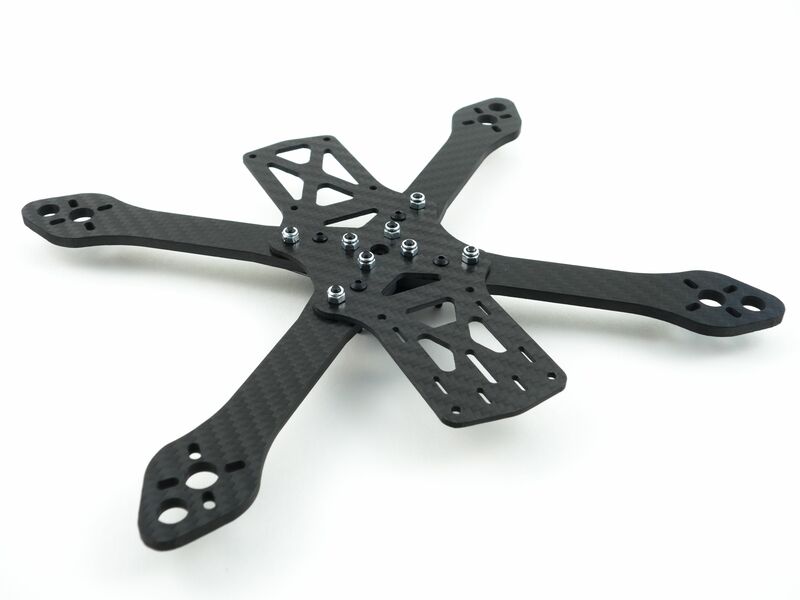 Ok i might go with them, also any idea how to mount the caddx micro f1 on the transtec frog frame? Look for a micro swift mounting adapter. Several stores sell it and you can even 3D print one if you have access to a printer. I believe they have them at Banggood if you don't mind the wait. Great build, Im looking to try this for my entry into the hobby. I have two questions. First, where exactly do you solder the capacitor onto the FC? I think I spy it connecting to the 5v and SBUS portioins, am I correct? Also, should I look into getting an antenna? I notice lots of build lists on here mention some sort of antenna. The capacitor is soldered under the main battery pads where the XT60 connects to the board. I used a couple wires to run to it to keep it inside the frame. The VTX comes with a linear antenna which works just fine for the most part. You can try it and if you feel the reception isn't very good, just swap it out for a circular U.Fl antenna. Thanks for clearing that obviously nooby question. I however have another: does this particular FC support betaflight in such a way to allow for OSD pid tuning? Yes, it does. Most modern boards should support OSD tuning at this point. First - Thanks for the great post, I appreciate the effort. as a complete novice - would you recommend this build? I am attracted to it for a few reasons - good detail, you seem to be actively supporting it, cost is within range, all parts seem to be outlined pretty well. I dont have goggles. I was thinking of Fat Shark Dominator HD3 which are expensive, but I want to have a great quality experience. Are these compatible? are they overkill? recommendation for goggles with this quad? I dont have a radio. I was looking at something like FrSky Taranis X9D Plus 2.4GHz ACCST Radio -- but again, is this compatible and/or overkill? What tools would you need to build this quad? Do you have any video tutorials of the actual build? ... can you be bribed to possibly make a video tutorial if not? As a novice... am I better off buying a preset package... a prebuilt drone? anyway, tons of questions - sorry... im just excited and want to figure out the best way to jump in. From a build standpoint this is great for a novice. It's not necessarily for a novice pilot though. You definitely need some experience at least on a sim, but flying a smaller micro brushless quad would be even more useful. You don't need to jump right into the high end goggles. You'd be perfectly fine using the Eachine EV800D, EV100 or even a VR006 if you want a very low budget goggle. A good soldering iron (Hakko 888D or the TS100), some 63/37 Kester solder, wire cutters, 14awg wire, shrink tubing of assorted sizes, precision tweezers, hex drivers, foam tape, and some small zip ties. Sorry, but there are a number of build videos on youtube. You might want to watch several to learn the process. I'd start with a pre-built micro like the Beta65S or even the Emax Babyhawk-R to learn how to fly acro. Then you can build a 5". First - Thanks for spending the time to write individual answers to my questions - I really appreciate it. I will wait on doing this build until I get some experience on a pre-built micro racer. My first drone (Holy Stone HS200 gift) is still up in a tree in my backyard taunting me - so I will take your advice and get some time before something this serious. I will maybe pursue this build after getting bored on the pre-built. I bought some Ev100s - cant wait to try them out. Going this route instead of the 400$ option was a great weight off my shoulders. I realize they wont be perfect - but it should go along way to get use to flying. I will eventually get some nicer ones if I get hooked. I will start getting some tools together as I clear my workspace in the garage! Thanks for the recommendations here - I will just blind buy this stuff. I went with a Tiny Whoop Racer - TWR. Ill give this a try - if it doesnt work out, I will probably try the Emax Babyhawk-R or just jump into this build directly. Thanks Again -- I should have everything in a few days - very excited. This is an awesome build. I have been flying almost 2 years and have a pile of gear. My main 2 matching freestyle quads started almost identical to this but I have converted them to Joshua Bardwell fc's and Speedix 30 esc's so I can run 5s or 6s on occasion. The performance of these are insane. I want to compliment one of the best builds I have seen online hands down. I have used all of these parts with some minor differences like camera and I am flying slightly lighter more compact QAV-R clones off Amazon but I do not support clones I just needed same day availability as a truck driver and they have worked out flawlessly. Also I have and fly that aio fc/esc but my main duplicate freestyle quads are built around Joshua Bardwell fc's and Speedix es 30 esc's because I wanted to get very into betaflight and possibly run 5s or 6s occasionally. Beautiful build and has inspired me to join rotorbuilds and post some of mine. Wow man, just gotta say - Excellent, excellent write up! Also What isnt included in the total build? I'm not sure I understand the question. You'll need some essentials like a soldering iron, shrink tube, wire cutters, double sided foam tape, and loctite. This also doesn't include a battery charger, power supply, transmitter, headset, etc. I was curious if I wanted to cut costs at all where could I? You don't need to use any of the extra screws and washers. Those are mainly for decoration. Other than that you could buy the cheaper Racerstar motors, but they won't have as much power. This is just amazing, thank you for this guide. Don't you get a battery sliced by the props in crashes from time to time, though? Hasn't happened yet! The battery pad really helps hold it in place. Thx whiffles for this build using it as base for my first build with few upgrades.. Looking for clear heatshink to fit ovet arms to protect some leds for non fpv flying any ideas? As well trying to find good mount for sessions hero5. You'll probably need some very wide heat shrink to get over the arms. You may just want to check your local hardware store. Bring the arm to see what'll fit. Most people will 3D print a Session 5 mount. There are a number of models on Thingiverse. If you don't have access to a 3D printer then you can order one from any number of FPV shops. I don't know if it's possible, but can you fit a runcam split mini in that empty front area? That might just work! You'd probably have to soft mount the boards on some double sided foam tape, but it sounds like a neat experiment. Hello! Complete drone noob here. I think i will build this drone as my first in the near future. But i have a few (noob) questions. Is this drone a 5in drone? And what props do you use for it? And lastly is all that fancy hardware needed for the build? Yes, this is 5" and I'd probably go with the DAL Cyclone 5046C tri-blades. They're tried and true. I only used the Racerstar props for the color. They fly okay, but not as well as the cyclones. And nope, the hardware is not necessary. I just wanted to experiment with the colors. I'd still use shorter standoffs. The kit comes with 35mm purple standoffs which make it far too tall. 20mm is perfect if you use the TPU camera mounts. You inspired me to make a similar build. I am going to use a different budget alien style frame than the martian, but still use the shortened frame standoffs etc. Awesome! Be sure to post it to the site when it's complete. The motors and the fpv transmitter are out of stock, do you have any suggestions for replacements for them? Search for any of the Samguk motors in the series. They've got 2306 and 2206 versions as well. If you don't need VTX controls over OSD then the VTX03 is a great little transmitter. Love the build. How are you using the 20mm standoffs with the 19x19 camera? best I can do with some tilt is 22mm. I generally use 20mm spacers with some 2mm spacers on the front standoffs. What do you use to mount the cam? The metal bracket doesn't work because it seats the camera too high for 20mm standoffs. The TPU mounts are perfect. You can situate the camera low enough that it clears both the bottom and top plates. I'm new to drones but I'm wondering why the HD camera is angled up like that. Do you flip the drone upside down to get footage of the ground and horizon? Oh, wow. Thank you for the information. Yes and these little quads don't fly level. They need to fly at an angle to get lots of speed. I wish i could hide this post! I am tired of looking at it!!!!! Can it stop being promoted!!!!! It is almost an add now! I'll probably run it for a few more days, but that is an idea. Maybe a feature to hide promoted posts. Martian II vs Martian Anniversary edition? They're both essentially the same except the anniversary edition is less forgiving concerning the arm length and prop options. If you use 25mm standoffs the props can brush the top plate if the arms aren't just right. Did you like the motors? I saw more guys telling they aren't good and just a few telling they are good (for the price). Yeah, how are these motors doing Whiffles? I've only had one chance to fly due to rain, but they flew considerably better than my previous builds using the Racerstar motors. These have a lot more power. Time will tell how durable they are. I plan on doing this build but putting RunCam Split for the camera. Do you think there will be enough room to fit everything in there? It may be a tight fit with 20mm standoffs, but maybe a micro split would work if you mount the boards directly behind the camera. Also how is the camera protection? The camera is fairly well protected and TPU mounts help protect it from any sort of impact. It should work as it's fairly flexible. I can't say as I haven't crashed them enough. They held up through at least one crash though. What's the average flight time? Most any quad of this size can do 3-5 minutes depending on how aggressive you fly. It's generally closer to 3 minutes unless you fly very slowly. From what I understand the Martian has 1619 mm motor mounts and don't the dys motors have 1616 mm mounts? How did you mount the motors? I had no problem with the motor screws. I've never heard of a 5" frame not supporting any particular motor. The only difference is when you go down to 1407 or 1306 motors which require a smaller screw configuration on a smaller frame. Does it work with raceflight, if so how do I set it up, and do you need a xsr for smart audio? This VTX should work with BF 3.3 as there are no issues with the tramp protocol. Sorry, I know nothing about Raceflight. Having said that, would you be able to get any tangible benefits if spending like 25 bucks more on the set? What would you opt for? F4 board, or something else? Cheers! You mean what would I upgrade for an extra $25? I'd probably go for the StarF4S for the extra processing power, but the F3 board is perfectly fine. Most folks can't even tell the difference between F3 and F4 boards. Another option is to try the Caddx SDR1. It's got better WDR and is 4:3/16:9 switchable. Sure thing! Keep in mind that I used about $15 worth of superfluous washers and screws ;) If you build it be sure to post it! You might actually be able to do it directly behind the camera with some double foam tape. Definitely an interesting idea! Looks great! Planning to build. Foresee any issues subbing the anniversary edition of the Martian II? I used that on my previous wizard killer and it's pretty much on par with this one. The only issue is the arms are slightly shorter, so if you're planning to use 25mm standoffs your props might brush the top plate. If you use 20mm standoffs like I did here you should be fine. Thank you. I appreciate your help on this. I'm new to drone building but looking forward to my first attempt. I have a win 2 from xhover which has been great and am looking to build a 5". Your setup looks great and I plan to build it. I'm currently looking into the additional component changes required for my radio. I have a spectrum DX6. I plan to use the SPM4648 https://rotorbuilds.com/part/13130. Are there other modifications I need to make to use this receiver? Is there any reason you don't go for a flush/countersunk top plate? I'm guessing structural? No problem! I just added the washers for style. They may add a tiny bit more to the strength, but it's marginal. I just took it out for a maiden flight and these motors definitely have some oomph! With the battery and Legend 3 it weighs in at around 590g, but it really doesn't feel that heavy. One motor took a head-on blow to the ground without any damage. So far so good! Very clean ESC cables setup!!! I have used the Martian II on all my builds for over a year, love the frame. That build it TIGHT TIGHT TIGHT! Question, which part on the list is for the camera, and would it fit a Foxeer Monster v2? I think this would be a great upgrade for all my quads to make them lower profile. Thanks! The only way to pull off 20mm standoffs is to use a micro cam and something like the TPU mounts listed. It's a tight fit, but you still retain the full camera angle range. To use a full sized camera like the Monster V2 you need 30mm standoffs. Using 25mm might be doable but it'll be a very tight fit with limited control over the angle. BLAH I need a 16:9 camera, wish they made a micro! I really like the low profile. This is a 16:9 cam. There is also a higher end model, the SDR1, that also does 16:9. What? $155 for that kind of power + performance? GET. OUT. I think that's what makes these DYS Samguk motors so appealing. Time will tell how durable they are though. Yeah I just watched Stu’s review of them on UAVFutures a few days ago. I need to give them a try. I really think these motors are a huge advancement in multirotors for both those new and experienced in the sport and hobby. By the way it’s cool that you’re located in Richmond - I’m out of Lynchburg! Awesome! Ever been to the Flying Circus in Covington? Stone Blue is in Lynchburg and they put it on every year. Are you going to be our there for Flying Circus this year? I went to the Flying Circus this past fall for a single night and it was fun. I just may consider going for the larger event this spring. How did you solder the XT60 "1.5cm" extension wire without the solder 'wicking' up the wire and making it stiff? I've tried to do this on a recent build but the solder wicked up into the wire (12awg) and made it completely stiff , thus seemingly defeating the purpose of having an extension on the XT60. It did stiffen up a bit, but it'll still bend at least. Without it a couple of my battery leads would never reach as they're quite short. hey first off great job, second off could you maybe look at my budget build. I have a little higher budget. I was also wondering how are the dys 2207s, what's the efficiency and power. I'm trying to decide between the 2206, 2207, and 2306 motors for my build. Shoot me a message when you get a chance. Thank you! I had a look at your mockup and left you a comment. I've yet to fly this due to weather, but from what I've heard the power is quite ample. According to the thrust charts the 2207 and 2306 are very similar in terms of power. Only the 2206 offers slightly less power. I would also recommend for anyone building this to upgrade the vtx it will cost maybe $5 more. Just make sure the vtx you upgrade has a power output of around 600mw, even though it is not necessary it is still nice to have the ability to put the power to 600mw. Also I would recomend upgrading to the foxeer mini camera its $19 and its ccd, not cmos like this caddix camera, it will give you a worst picture quality but IMPROVED latency which you need when fly quads fast. I don't think 600mw is entirely necessary. I've always flown 200mw without any issues. And lately the CMOS cameras rival the CCD cameras in terms of latency. I think going forward CMOS will become the norm. The nice thing about the Caddx F1 is you have a choice between 4:3 and 16:9. This is particularly prudent considering all the new 16:9 headsets coming to market. Also an actual antenna might be nice if you have the money, perhaps a foxeer pagoda, they are only $10, and will give you better video feed than the dipole on this build. Yes and a U.fl to SMA cable. The dipole works great, but an antenna upgrade would help a bit. Plus sick looks? I take my hat off to you.